According to the WWF (World Wildlife Fund), since 1970 60% of the mammals, birds, fish and reptiles on the planet have been driven to extinction. To the extent that the WWF has it right, climate change accounts for less than 10% of these losses (graph below). As important and logistically complex as resolving climate change is, it is but one of a host of environmental ills in equal or greater need of resolution. Habitat degradation and loss and animal exploitation (e.g. trawl-net fishing) explain most of this animal extinction. Habitat loss is primarily due to deforestation to feed factory farm animals. According to the Guardian, these animal losses would require 5 – 7 million years to recover from. But as of today, the causes of extinction continue unabated with no plausible plans being put forward by national governments to address it. Graph: Of the mass extinction of animals that the WWF is reporting, most comes from habitat loss and degradation. Climate change explains less than 10% of the losses. The point isn’t to downplay climate change, but to express the breadth of the environmental crisis that the world now faces. While the role of global warming will increase in time, mass extinction is at present a related but separate crisis in need of resolution. Source: wwf.org.uk. Mostof the relation of climate change to mass extinction is based on an analogy. The ‘Great Dying’ extinction of 250 million years ago resulted from global warming caused by volcanic emissions of greenhouse gases. It mainly affected marine life through oxygen depletion. While there is a logical relationship between marine, animal and insect extinction— they are all extinctions, to date, oceanic oxygen depletion has more direct causes in agricultural runoff. The appeal of assigning climate change as the cause of mass extinction is that solving climate change would in theory solve it. However, Raj Patel of the University of Texas-Austin is one of a number of environmental theorists who argue that industrial agriculture— including deforestation, monoculture planting and the use of pesticides, explains the insect and animal extinctions quite well. That oceanic dead zones ring industrial economies supports the interpretation that they are caused by agricultural runoff. 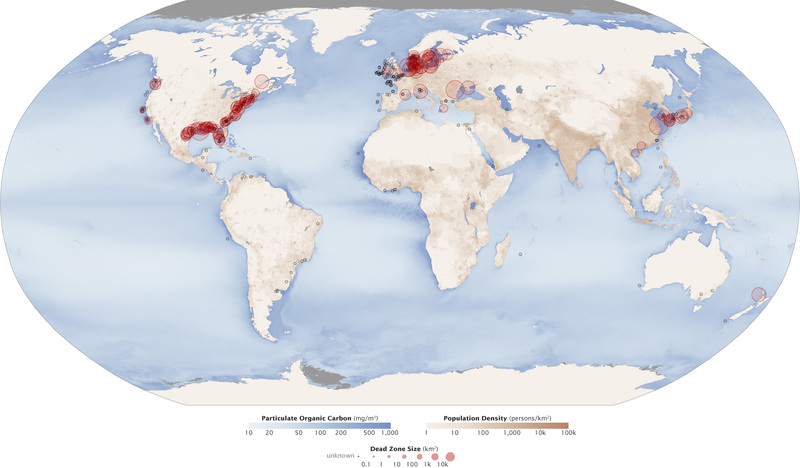 Graph: Oceanic dead zones, the product of runoff from industrial agriculture and industrial pollution, track American industrialization and the export of the American industrial model. The red circles surrounding industrial economies represent dead zones. Following WWII, the U.S. exported American-style capitalism to Germany and Japan through the Marshall plan. The U.S., Germany and Japan also feature prominently as cumulative emitters of CO2. Source: nasa.gov. The point here is analytical and tactical, not semantic. If industrialization is narrowly at fault for related environmental crises— say through greenhouse gas emissions, then ‘green growth’ is at least theoretically plausible through some combination of reduction and mitigation of greenhouse gas emissions. But this isn’t the case. The insect and animal mass extinctions appear to be related to climate change through a shared cause— industrialization. The social, political and economic challenge is that ‘green growth’ is to tweak the status quo, whereas broader environmental resolution requires fundamentally reconsidering everything about capitalist modernity. Now. It is ultimately irrelevant that doing so has been a goal of some Left political programs for years and decades. There is no plausible exit from the current predicament emanating from the established order. The status quo is untenable, not a haven. The habitat loss and degradation that substantially explains the insect and animal mass extinctions ties directly to animal agriculture— land is being cleared for animal grazing and to grow feed crops for factory farms. The crops grown are genetically engineered (GMO) to allow them to withstand systematic, late-stage applications of pesticides and herbicides. This agricultural ‘process’ is industrial from start to finish. The industrial logic at work illustrates the conundrum. Factory farms are ‘efficient’ in the narrow sense of favoring commodity animals by decimating populations of non-commodity animals. This is done through monoculture planting of feed-crops to exclude / decimate non-feed crops. This decimation is accomplished using pesticides and herbicides that eliminate ‘losses’ to non-feed plants and insects. Annihilation is the point, not an accident. The realm of interest— commodity production, excludes consideration of broader environmental relationships. Rendering each step of the agricultural process efficient assumes that the total process is efficient. Another way to say this is that what isn’t known— the unquestioned and unexplored reciprocal of this efficiency in nature, is assumed to be irrelevant, and therefore benign, by intent. Environmental destruction can be hidden by industrial food production until total extinction becomes inevitable. This last point requires elaboration. Local, regional and global food chains are webs of relationships that once destroyed, take millions of years to regenerate. Through causing mass extinction, industrial agriculture leaves no ‘plan B’ in place. By the time that industrial food systems begin to fail, alternatives to it will have been destroyed. As of now, a return to pre-industrial agriculture is possible. However, technology will never replace large, complex and barely understood natural relationships. In the 1980s pesticide and herbicide resistant GMO (Genetically Modified Organism) crops and a new class of neonicotinoid pesticides were introduced. It took twenty years for some of the causal mechanisms behind insect extinction to be linked to neonicotinoid pesticides. Early on GMO crops were planted next to non-GMO crops, guaranteeing cross contamination. This recklessness reflects a logic: industrial efficiency is the reciprocal of the broader relationships at work. This is one possible explanation for the insect extinction measured in Puerto Rico despite a drop in the quantity of pesticides used there. Neonicotinoid pesticides can destroy the reproductive capacity of ‘non-target’ insects, meaning that they can adversely affect entire populations rather than just exposed insects. Amongst honeybees, Queens produce honeybees for the hive— the power to reproduce isn’t generally distributed. This particularity is antithetical to the commodity (generic) conception of industrial agriculture. Recognizing that type and quantity are separate issues, the EU (European Union) is moving to ban the outdoor use of neonicotinoids linked to colony collapse in honeybees and mass die-offs of birds and bats. However, and here is the rub— with full knowledge of the adverse consequences of earlier pesticides, manufacturers promoted neonicotinoid pesticides with little to no understanding of their long-term consequences. For twenty years neonicotinoids were sold as the safe alternative to earlier pesticides. The commercial logic behind this ‘product development’ strategy is that the narrower the research into adverse consequences, the lower the production costs and the lower the likelihood that adverse consequences will be found. This is more than a case of perverse incentives. Neonicotinoids were developed to replace earlier pesticides that also took twenty years for their adverse consequences to become known. In other words, the research process was known to be a serial failure before neonicotinoids were introduced. The principle that ‘markets’ determine the ultimate social utility of products is even less probable. Ninety-nine-point nine percent of ‘consumers’ have no idea what pesticides are used in the production of the food they eat. Industrial farmers— corporations, care about crop yields. Until these are impacted, they have no reason to look further. The industrial scientists who create new pesticides answer questions derived from earlier problems. At no relevant point are adverse consequences known when ‘consumer’ decisions are made. Industrial pesticides might even be ‘adequately’ tested, meaning to the full extent of what is knowable within the given logic. But ‘true’ knowledge of their impact has followed a predictable path. Earlier pesticides and herbicides produced unintended consequences despite being tested. In other words, adverse consequences are the predictable outcome of this production logic regardless of which methods are used to predict them. The evidence: neonicotinoids were (1) tested and (2) followed this same pattern of producing unintended consequences. Graph: Every recession since WWII has been intentionally caused by the U.S. Federal Reserve raising interest rates to limit wage demands. ‘Recessions’ are another term for ‘degrowth.’ In other words, capitalists love degrowth when it serves their purposes. This is why economists on the Left tend to reflexively oppose degrowth. But if recessions are necessary to the proper functioning of capitalism, isn’t the problem capitalism? Source: St. Louis Federal Reserve. Given the environmental stakes, arguing against the logic of capitalism would be pointless without bringing it back to environmental logic. Whether it is cause, effect or iterative, capitalism is deeply embedded in the social complexity that defines modernity. Most in the West buy their food in a store and have no idea how to produce it. This largely explains why market relations define so much of the realm of available social logic. Phrased differently, climate change and mass extinction strongly suggest that something is missing from the available social logic. This social complexity— deeply interwoven social, political and economic relationships that make even small changes to the existing order dangerous for large numbers of people, constitutes a doomsday device of sorts given the environmental reckoning that is underway. Agricultural complexity— systems that billions of people rely on for sustenance, can be left to collapse on their own or their unwind can be planned. Lest this seem unduly alarmist, insect, animal and marine mass extinctions are already far along. Question: if a group of people proposed killing 60% – 80% of the animals, insects and marine life on the planet while emitting enough gases into the atmosphere to cook the planet, should their stance as ‘centrists’ be taken seriously? And possibly more to the point, does it make a difference that until around 1980 they didn’t know they were doing so, and after they were told they accelerated the damage caused? The term ‘sociopaths’ seems more descriptively accurate. Because animal agriculture is so resource intensive, were it to be abandoned, existing food production would greatly exceed what is needed to sustain people. This would facilitate a move away from industrial agriculture toward local, small scale and regenerative agriculture. It would also reduce greenhouse gas emissions by 20% – 50%, depending on whether deforestation is included in the calculation. Otherwise, environmental problem solving begins with identification of the problems and then steps are taken to bring them to resolution. What doesn’t work is to spend decades ignoring and understating problems and then proposing half-measures under the theory that something is better than nothing. Half-measures proceed from the assumption that danger comes from action, rather than inaction. Mounting evidence suggests that this isn’t the case. Another way to frame this is that problem solving can come through technological innovation, which has a long history of producing unanticipated adverse consequences, or through stopping doing what is causing problems. With the latter, the consequences are largely known— the problems are ended. To the extent that basic material needs could be met through ending animal agriculture and militarism, the capacity to resolve mounting crises exists even if the political will doesn’t. According to decades of polls, most people want to do the right thing when it comes to the planet. This illustrates the divide between political and economic democracy. Economic concentration is used to crush political democracy. Without suggesting there are any simple or easy answers, breaking economic concentration is a necessary step to restoring the power to resolve environmental crises. Additionally, it would remove the logic of accumulation that is killing the planet. Finally, the term ‘creative destruction’ in the title was conceived by Joseph Schumpeter to glorify the revolutionary nature of capitalism as replacement through innovation. With climate change and mass extinction at hand, what is being replaced is life on the planet. It’s good to know that there is a theory that ties to the process, although I’d hope for a better epitaph. Rob Urie writes on political economy. His book Zen Economics is available from CounterPunch Books.